Just how big is the Amazon cloud anyway? Everyone knows Amazon’s(s amzn) cloud is huge. But many want to know exactly how huge it is. The latest to try is Deepfield Networks, a stealthy startup that worked with unnamed “network provider research” partners to figure out how much Internet traffic flows into and out of Amazon’s cloud. 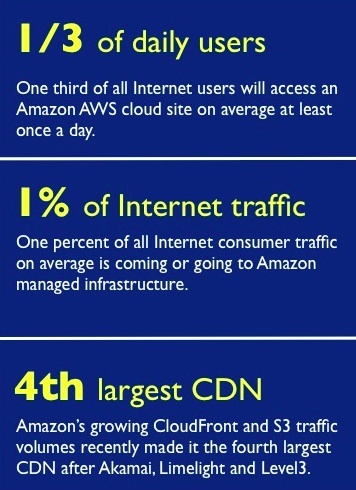 It found that 1/3 of all Internet users hit Amazon-based services at least once a day and that 1 percent of all web consumer traffic is moving either into or out of Amazon’s cloud. In an interview, Craig Labovitz, co-founder and CEO of Deepfield and a former chief scientist at Arbor Networks, said the network partners provided anonymous backbone data about millions of users, mostly in North America– a sample big enough to be statistically relevant. One way to gauge the importance of Amazon is to ask how frequently will a typically Internet user visit a web site based on Amazon infrastructure? The answer: an amazing 1/3 of all users every day. This number is all the more impressive when you consider that our data includes millions of users and end devices of limited scope or activities, such as users who only check mail and home game consoles. Another measure of Amazon’s size — that EC2 runs on more than 450,000 servers — was posted by researcher Huan Liu last month, causing quite a stir. Amazon periodically discloses fun facts about how many objects are stored in its S3 storage service — it closed out the first quarter of 2012 with more than 900 billion objects for example — but those tibits just whet the appetite for more data. As more companies weigh a move to cloud computing, this curiosity about the number 1 cloud player will only grow. Witness the burst of startups — Newvem, Cedexis, Cloudability — coming online to offer glimpses of what goes on inside Amazon Web Services. Still, Amazon’s cloud overall remains pretty much black box. The cloud in itself is huge. In 3 years, it would generate some 14 million jobs! I don’t think KVM or Xen as the choice is relevant in any significant way. When those guys were designing their cloud solution, they picked the most appropriate one at that time and ran with it. Once you’ve built something big and successful as AWS, you swap out a critical piece like the hypervisor only if the new one is significantly better than the current working one. If it ain’t broke …. Never forget those numbers if people tell you about KVM being the future and Xen being not relevant.